The revival of McQueen style: Iris Van Harpen, a young Dutch designer with an internship in London and another with Claudy Jongstra in Amsterdam. 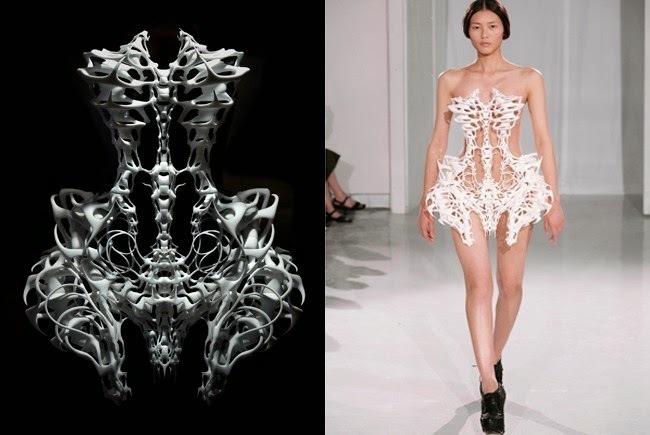 Her creations are true sculptures; she creates outfits that combines traditional craftsmanship with innovative techniques through the use of futuristic materials. She works the leather in a totally unusual way, often using synthetic bones of whales. Lady Gaga, Dita Von Teese e Bjork...ovviamente! Lady Gaga, Dita Von Teese, and Bjork...obviously! ...Of course, it takes courage! !